He has made his mark in various languages of the Indian Cinema, Hindi , Tamil, Telugu, Malayalam and what not! A man who is extremely talented and a man to whom music comes naturally; A prodigy that he is, here’s more about his contribution in the Bollywood industry. What brought this man to limelight was ofcourse his ‘Breathless’ which was released in the year 1998. After this many music offers danced to his tunes and now Shankar has over a few hundred’s to his hat. Mission Kashmir which released in 2000 gave him another break as Bumro Bumro created a rave amongst all audience for its fast paced beats. ‘Dil Chahtha Hai’ although proved to be the luckiest for Shakar in his career as it led to him exploring the avenues of becoming a Music Director as well. Donning the hat of a Music Director in 2001 with this, Shankar still continued singing as well and gave hits like ‘Rock and Roll Soniye’ and ‘Where’s the perty tonight’ in the year 2006 and ‘Jhoom Barabar Jhoom’ in 2007. Lakshya which released in 2004 is also a good mention in his steady career. ShankarMahadevan has never been out of movies and infact there have been hits coming his way one after the other. My name is Khan which hit the theatres in 2010 is yet another example – the song Noor e khuda stole everyone’s hearts. Remember Taare Zameen Par? What was one thing you can’t forget about the movie? Ofcourse the song – ‘Meri Maa’ and thanks to Shankar’s soulful rendition yet again. 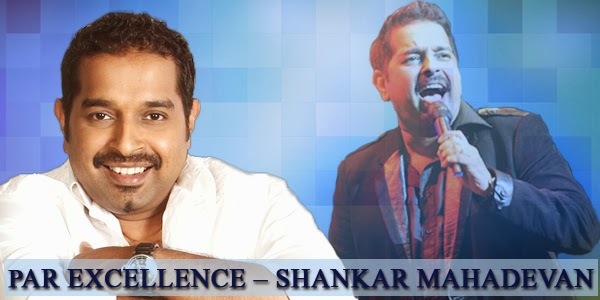 ShankarMahadevan has recently ventured into his training academy for all music enthusiasts. Raaga.com wishes him all the very best for it.